South Australia’s version of Eros Day began on 1 October 1935 when two young medical students from the University of Adelaide knew they would be in England around the same time so set a place to meet in London “for a drink and a chat”. Unlike today – there was of course no sms text or email to make their plans so they predetermined they would meet here, six months before hand, while still in Adelaide, setting the date and a noon meeting time. 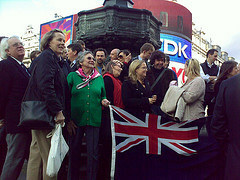 They chose the Statue of Eros at Piccadilly Circus because they heard it was reasonably central. The beers (undoubtedly warm) went down so well that they decided they should meet again and duly set the same time and place the following year. Twelve months later a few more friends came and it grew steadily from there. Please join the Agent General Bill Muirhead on the steps for the traditional photograph at 12pm sharp and then afterwards you can enjoy a ‘drink and a chat’ with fellow South Australians continuing the Eros Day tradition. If you know of any other South Australians who will be on holidays in London at this time, please pass on these details. RSVP IS ESSENTIAL – if you will be attending PLEASE EMAIL info@south-aus.eu by COB Thursday 27 September 2012. More information on the South Australians in Europe Facebook page.